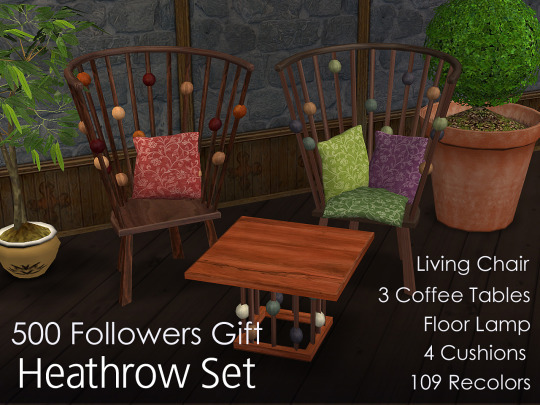 Furniture set with THREE recolour groups!!! The reason why this is amazing is because there are 3. THREE. THREE!!!!! recolour groups for one object. What she's done is have the deco balls as a separate slaved object that is placed when the chair is placed. So clicking on the chair recolours the frame and seat, clicking on the deco balls, recolours the balls. I'm having a nerdgasm here. What really, really interests me is taking a look to see how she got the balls to place at the same time as the chair.. kind of like the "3 subsets" of the Grand Trianon set but better. It sounds like the balls have their own textures though, so yeah, gonna have to take a look someday! What I'd love to do is see if this can be used for other objects. Thinking about 2 subsets for the frame, one subset for the bedding for BB's Oh Baby cradle. I've always been a bit disappointed with the graphic on the crib being stuck with the wood frame. I just quickly looked at it in SimPE. That is some clever BHAVing they did! From what I understand, it should be possible for other objects. It really is genius.